Reunited with Gitta in Israel. efore we left for Israel, Rick and I travelled to Riga to say good-bye to my beloved Aunt Sonia, with whom Id been corresponding. (Her husband, my mothers brother Abram, had died some years before.) Sonia had been very good to us and at the time I feared we would never see her again. Happily, we did; she and her daughter Gita subsequently moved to Israel. When we left Poland, we were allowed to take more things out of the country than my sister Gitta had been able to in 1950. We filled a lift, a huge crate, with our Förster piano, our dining room set, and other furniture. Leon hadnt been able to sell his glassmaking business, so he simply gave it to a devoted worker, Marian Tyczynski, who was still running the business when I visited Poland in 1989. But we did take along some of the glassmaking machines. They too went into the lift. And before we left Poland, Leon had replaced his BMW motorcycle with a new, smaller, red Java and that came with us as well. Because you werent allowed to take money out of Poland, we also brought things we could sell in Israel  a couple of fridges, some bicycles, carpets, washing machines, and so on. All of it was shipped by sea in the lift. You can imagine how big it was. We did try to take some cash out of the country  it was hidden in the piano  but the officials found and confiscated it at the border. We travelled by train to Genoa, Italy, where we were quarantined for weeks because of a flu epidemic. Rick and Eva were introduced to Coca-Cola in Genoa and Rick couldnt get enough of the new drink. It only costs cento lire, he would remind me when I told him he couldnt have any more. While we were in Italy, we travelled to Milan to visit Adam and Rena Meisner and their daughter Clara. The Meisners were the friends from Kalisz with whom we shared a freight car on our way to the sofhoz. They too had survived the war and had opened a kosher restaurant in Milan. 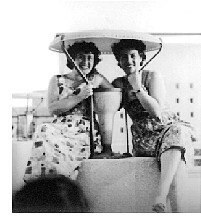 Mira (top), named after my mother, died of Tay Sachs disease in 1950, just a few months after Gitta and Josef moved to Israel. Naomi, their second child (below), was born in 1953 and died in 1955, also of Tay Sachs. Finally, we were permitted to board an Italian boat that would take us to Israel. We travelled by boat from Genoa to Haifa in October 1957. The boat was small and we had a rough passage. Men and women were segregated from one another; I have no idea why. Leon and Rick were in one part of the vessel, Eva and I in another. It was an anxious time for Leon and me. Leon was thirty-four, I was thirty-one; we had a nine-year old son and a three-and-a-half year old daughter with us and were beginning a new life. Wed left the country of our birth behind us. Gitta and her husband, Josef, met us in Haifa. I hadnt seen my sister in eight years. We couldnt let go of each other. Rick had been a baby when shed left for Israel and shed never met Eva. In the years since Id last seen her, she had given birth to a second daughter, Naomi, in 1953. 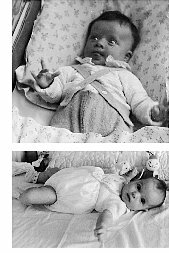 But Naomi, like Mira before her, was born with Tay Sachs disease and had died in 1955. The tragic deaths of Gittas children had made me all the more want to emigrate to Israel so we could be together. Now, at last, we were. Gitta and Josef took us to our new home, a very basic, prefab bungalow in Kfar Saba, the town where they lived in Israel, north-east of Tel Aviv and not far from the West Bank. The house had two rooms and no electricity. But thanks to Gitta and Josef, we were lucky to have even that; most new immigrants were living in tents and tin shacks. And theyd also arranged for us to live next door to Peter and Alina Smuszkowicz, two other Polish immigrants who had arrived in Israel a few months earlier. Gitta had helped Peter get a job and I became Alinas ally and trusted friend. Peter and Alina were to become lifelong friends.